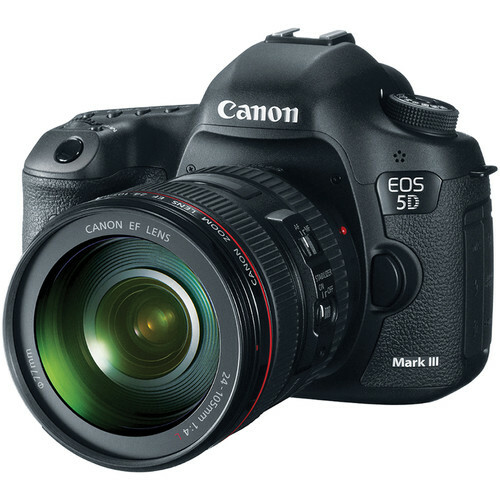 EOS 5D Mark III DSLR Camera with 24-105mm Lens is rated 4.9 out of 5 by 641. Rated 5 out of 5 by Larry F from Best Canon EOS I've Used Upgraded from a 7D to the new 5D Mark III and could not be happier (ok, if it only weighed 12 ounces and fit in my pocket I would be happier but that's not my point). Moving to full frame is incredible and the camera's autofocus and exposure is spot on! This is a camera I will have for a LONG time so the cost, when averaged out over the years of use, was justified in my mind. B&H sales department was fantastic in the order & shipping process as well. If I'd know what a difference having a full frame camera made, I'd have had one a long time ago. I highly recommend this camera if you're thinking of upgrading an older model. Rated 5 out of 5 by Geoff from From 20d to 5d mark III Great camera for outdoor shooting. The last full size sensor is when I used was film in the 1Vhs. The 20 d was a great learning camera for the past 6 years. Now it was time to move on. The 5d mark II had been out too long for the technology to be up to date. The Mark III came so now was the time to upgrade. The learning curve was quite unexpected. It will take some time to learn all the features this has to offer. Out of box this took pictures far better than I expected. I really apreciate the large 3.2 inch LCD, I can even read it without my glasses. I really don't have anything bad to say about it except it will take time to learn everything about it. Rated 5 out of 5 by Ski Man from Unbelievable camera, lens just O.K. Soon after purchasing this camera & lens from B&H, I was asked to review. How could I do so when I hadn't really used it? It has been a year and a half now, and the camera is superlative in many ways, primarily in the image it produces--the other computer-like bells & whistles be darned. The noise suppression is PHENOMENAL! However, I wish I had bought the Sigma 24-105 lens to go with the 5D. The Canon 24-105, although an L is, sadly, like many other Canon EF-S lenses I have purchased for the 20D, 30D, 40D and 7D, is lacking. Much distortion, lens creep and and unsharpness on the edges. Rated 5 out of 5 by A.M. Daniel from Beautifully Crafted The 5D Mark III is a beautifully crafted piece of camera gear. It is big, not huge, so it is also a commitment you have to make if you plan to carry it around all day. The menu is extensive but easy to handle, especially when you use the two different wheels for navigation. The lens is super crisp and the many autofocus points ensure that you'll get the focus you need. I am still getting comfortable with the camera but if feels really good in my hands. My last camera was a Canon 50D so it is definitely the same family just more to it. Having the ability to set a much higher ISO than before is a big plus. Overall, I am very happy with the camera and 24-105mm lens and am looking forward to years of enjoyment. Rated 5 out of 5 by Limited Mind from Photography Nirvana I progressed from using Nikon F4 film, gradually into digital photography with D100, D2H, then D2xs. I had accumulated a few lenses along the way. But the more I read about the D800, I couldn't avoid the comparison between it and the 5Dm3. And for a period of six months or more, the harder I tried to convince myself to buy the Nikon, the more I found the Canon more irresistible. Finally when B&H had the Canon 5Dm3 with the 24-105 L competitively priced, I succumbed. Shooting with the camera for the past four weeks was night and day (or you might say ISO). Night shooting becomes enthralling instead of frightening. I may still return to get the D800, but at this point my heart is content. Rated 5 out of 5 by Avianti from The new love of my life, Mark the 3rd! I am beyond happy with the choice I made to buy the Mark iii camera. I was told by 3 major pro photographers it is one of the best to work with and it truly has been. I learn something new about it everyday. I'm able to have clear images as I'm editing the photo. This camera is going to be one for my office use as well which we are taking photos of detail work in fine jewelry. With the 100mm lens we are able to get details and able to make our clients dreams come to life. With the Mark iii we are able to share with photos of images for other clients to see around the world. Amazing camera and haven't found anything that isnt great about it. Rated 5 out of 5 by Billy T. from AWESOME CAMERA, AWESOME LENS I am a professional photographer and have been needing another camera for a while. My primary camera has been the 5D Mark II, so to lower the learning curve I ordered the 5D Mark III thinking it would be mostly similar. While it has some similarities, it is very different, but it is MUCH better. I've loved my Mark II and would have never thought that it could be improved upon, but what a difference! The Mark II took crisp, vivid photos, but now the Mark III took it to the next level. The 24-105 L lens that comes in this kit is AWESOME! Perfect range for portraits, and it (along with the other accessories) makes buying the kit a no-brainer. This camera does not come with Wi-Fi. I am Indian i want 5dmarkiii camera so plese asking the way context no 09848860413 . If you add a Canon 5D Mark III to a B&amp;H shopping cart, you can calculate the items costs, shipping methods, time for delivery, any taxes and total costs very quickly. You then pay by credit card and we will ship within a business day. Is it compatible with the Canon Timer Remote Controller TC80N3? Yes, the TC-80N3 is compatible with the Canon 5D Mark III. The only payment option we have that allows for later payment for the customer is the PayPal Credit payment option. PayPal Credit is only available to residents of the United States, and is subject to credit approval; they would offer six (6) months with no interest. You would simply have to go though the Checkout process on our website, and on the Payment Information page, select PayPal Credit as your payment method, and it will ask you for the last four (4) digits of your Social Security Number and your birth date. PayPal Credit will let you know immediately if you are approved or denied. If you are approved, it will allow you to proceed with the order. If you are denied, PayPal Credit will send you a notice in the mail within 30 days explaining the reason for denial. B&amp;H is not involved with the approval/denial process used by PayPal Credit, and cannot give a reason for approval/denial. what is the highest resolution of this camera? 5760 x 3840 is the large RAW or JPG size. How many pixels/unit does the Canon d5 mark 3? The Canon 5D Mark III has a 22.3 megapixel sensor. What software is included that will allow for editing the meta data recorded with each photo such as copyright and owner name? The Canon EOS Utility Software is included with this camera which will allow for editing the metadata, copyright info, and the owner's name.